The Everest Base Camp Trek runs through the Khumbu region of Nepal, typically starting at Lukla and ended up at the Everest Base Camp. While the higher sections of the region are known for extremely cold and adverse weather conditions, there are times throughout the year where the weather stabilises and tends to be very mild, making it great for trekking. It is important to understand the weather patterns of the region when planning your trek to ensure you get the most out of your time spent in the area. A few considerations must be taken into account when deciding on the best time to trek to Everest Base Camp. Broadly these are the weather conditions, busyness of the routes and the availability of guided tours. This article provides an overview of the seasons in Khumbu region of Nepal and how they affect the Everest Base Camp Trek so that you can better decide on when to visit the area and take on one of the world’s most iconic treks. Contrary to what you might think, the best time to trek to Everest Base Camp is not during the height of Summer. Rather, large window periods on either side of summer provide the best conditions for the trek. The spring months are probably the most popular in the region as a whole. You might be caught in the occasional snow showers if you catch the end of the winter season, but the weather should be largely stable and dry – perfect for trekking and high altitude climbing. The ideal weather comes at a price as the routes during this time will be at their busiest. Most Everest summits occur during these months so you will likely come across many climbers, summiteers and their support crews! The region is also the most vibrant at this time of the year, with many of the routes flanked by flowering rhododendrons. Clear days are characteristic of this popular trekking period. Although colder days (and colder nights) are to be expected, this is a small price to pay for the wonderful vistas and perfect views of the regions peaks. The odd snowstorm has been known to hit the region during this time so be sure to pack correctly! An added bonus of trekking during this time is the option to choose some other, less well-known routes in the area that still offer amazing views but without the hustle and bustle of the more popular routes. The Gokyo Lakes Trek to the Everest Base Camp is a perfect example. The region during this period can best be described as being very cold but still able to be trekked. The days will be shorter and there is a lot more snow, thus routes that involve crossing big passes like the three passes trek are usually closed. The weather will be fairly stable and dry, meaning it is entirely possible to trek the classic roite to Everest Base Camp in these months. Expect temperatures as cold as -30°C at night higher up the route so be sure to bring the correct gear. If the cold doesn’t bother you and you want to avoid the crowds, trekking at this time may be just right for you. Why not even consider a Christmas Everest Base Camp Trek as a festive alternative to the more typical Christmas activities? Rain, rain and more rain. The monsoon season is in full swing during this time of year as the warm, moisture laden water from the Indian Ocean causes rapid downpours. The routes tend to be very empty with only high-altitude die-hards braving the rains. Slippery trails, leeches and the lack of mountain views seems to be sufficient in off-putting most trekkers from visiting. There are a few areas, called rain-shadows, that provide good trekking conditions even during the monsoon months. The Annapurna Circuit is a good example of one of these rain protected areas. Stay away from the monsoon months of June through August. The trail conditions are not the safest, the trek will be wet and unenjoyable and you won’t even be able to get any great pictures of the beautiful mountain peaks. Aim to trek in the peak months of February through May and September through October as you are guaranteed stable and mild weather. The classic route will be busy but this will do little to detract from the natural beauty of the area. If you really want to avoid the crowds and are prepared to invest in some proper cold-weather gear, trekking during the winter months may be for you. Keep in mind that many tour operators will not offer guided tours during the off-peak months and that many of the usual routes will be closed. Be sure to check before booking your flights! For a live weather forecast of Nepal, click here. hi!! I am currently booked to trek to EBC March 15-30. I am a little concerned about the cold temps and am considering going mid to end of April or into first 2 weeks of MAy. What is your favorite 2 weeks and what are the temps like?? Hi Kim, that is a tough one to answer. April and May do tend to have more stable weather that is slightly warmer than March, but there is not a huge difference in temperatures. Lower down the trail you will find the temperatures are quite warm during the day, but cold at night and in the early mornings. As you get higher up the daytime temperatures drop and you will need to layer up. Nighttime temperatures are also cooler. You will notice the biggest differences between March / April vs April / May in temperatures at night. But as I said this won’t be significant. The real difference is in terms of number of trekkers on the path. There will be many more people on the trail from April through to the end of May as the Everest climbing season kicks off around the beginning of the 2nd week of April. March will be quieter, with fewer trekkers on the trail and quieter / less busy teahouses. If you are looking to experience the EBC with fewer people around I would say go for March. If you want to experience the hustle and bustle of the Everest climbing season and see some activity at EBC, then mid April through to mid May is the time to go. Hope this helps! We will be there on the 14-28, taking the basic same route to Lobuche, then climbing it. Three years ago I was there during these dates and here is what you can expect. Warm during the day in KTM, Lukla and Phakding. Once you start the climb to Namche, you will notice a difference. When you in sunlight, you will feel warm and remove layers. Once in the shadow of a mountain, you will be putting the layers back on. My advise is layers and you’ll need a good down coat for the higher altitudes. Also, bring you favorite spices and a solar pack charger for your batteries. Enjoy! You will love it! Hi Neelam, in terms of weather it could be a little hit and miss. The likelihood of rain and poor visibility is higher than in April or May, but you may get a great week! In terms of crowds the trail will be a lot quieter than April / May. All the best! I’m planning to go for EBC and chances upon your site. You seem to be very ecperienced. Appreciate if you can help me please.. I know you mentioned best time in an article but which will be the warmest month to go for. I’m just concerned about cold weather.. i have low blood pressure and my extremities get numb and tingly even with proper gloves on in europe’s winter right now. So, just want to check the temperature ranges.. it’s all relative and dressing well (layering) but numbers might help me decide! 🙂 or maybe i should do Annapurna!! Any input/tips will be great help! Hi Payal, appreciate your concern about temperatures. It’s a difficult thing to advice you on as the temperature fluctuates so much as one ascends in altitude. The warmer months are however – April-May or September-October. If I was pushed to give you a month I would say September, just after the monsoon season. Hope this helps. My husband and I are hoping to trek to EBC this December. While doing some research, I stumbled across your incredibly informative site! I’m wondering if it is difficult to find guided treks during this month, because it is off-season and colder than many people might find comfortable. We like the idea of a less crowded trip, and since my husband is a photographer, the clearer views during the dry winter months are very appealing to him. Aside from the climate, what else should off-season trekkers consider? Hi Kimberley, thanks for getting in touch. You shouldn’t have a problem finding guided trips. A good number of people trek over the winter season, some try to time there visit to EBC with Christmas! Many teahouses in other regions of Nepal close during the winter season, but in the Everest region most stay open. So nothing to worry about in terms of accomodation. Apart from that, make sure to take a warm four season sleeping bag, and lots of warm layers. It can get really cold at night and in the early hours of the morning. Hope you have a great trip! Great stuff.Please keep it up! 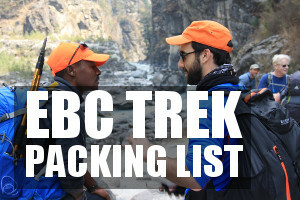 Heading off on the EBC trek in early September 2019. I’m a bit concerned about the flight from Kathmandu to Lukla and back being delayed due to bad weather, looking at the whole trip at about 17 days door to door, do you feel this is sufficient time as some of the guys I’m with have limited holiday allowance. Hi Mick, 17 days if you take the classic / standard route is more than enough time. 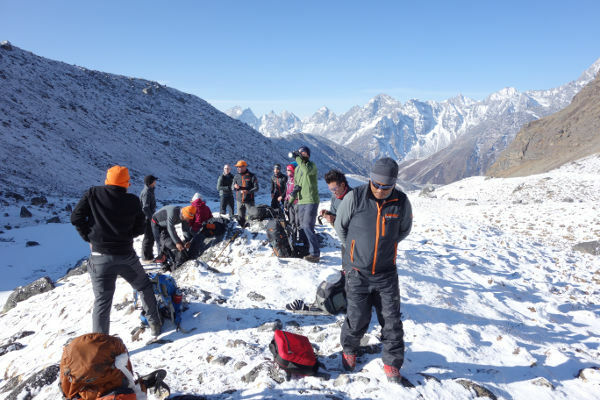 If you decide to do a variation route, like the Gokyo Lakes trek, then you will be pushed for time. Hope this helps! My girlfriend and I are planning to visit EBC and originally had planned to go in late october-November. We are now considering April. What month do you suggest is the best do to in terms of views? We are okay with the hustle and bustle. Hi Laura, April is a great month for the trek and visibility is usually excellent. April / May coincides with the climbing season so there is a lot of activity on the trail, in the teahouses and on the surrounding peaks. Hi Mark, thanks fot yhe information. I am still not able to make my mind, as to whether to go for the trek to EBC on Dec 22nd this year or not. I am might afraid of cold. I cant tolerate it. I want to go but never stayed in sub zero temperatures. Also i am not well equipped with cold weather clothing and gear. Kindly advise. Hi Mark, thanks for the great advice on your website. We are planning on EBC trek Oct/Nov 2019. Apart from the cold weather is it safe to trek so late in the season. We’d love to experience snow but not to the extreme. We’re looking for a camera to hopefully capture some amazing shots of our adventure. Any tips on what type of camera we should buy? something capable of taking good movies. I did around Annapurna many years ago and have wanted to return to Nepal to do the three pass loop with my adult son. I am interested in an April trip, without sherpas or guide, as this worked well before. Are there plenty of tea houses, so we needn’t carry tents or cooking stuff? 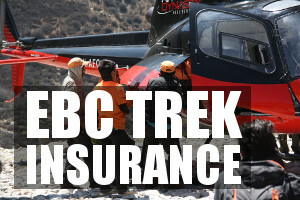 And how much does a helicopter flight run back to Luckla at the end of the trek? Hi Robin, yes, there are plenty of tea houses, so no need to carry tents / cooking gear etc. Just make sure you plan your route well so that you can make it to the best villages / tea houses each day. Helicopter flights vary, we took one from Dingboche to Lukla about 4 years ago and it costs $1000 I think.